Riding in the cycle track southbound towards the Magnolia Avenue “Y”. Riding in the cycle track southbound next to Elston Materials’s property. The parking space and wide area in this photo are for a tanker truck as seen in this photo. After seven months without them because of neighbor and weather delays, pavement markings make their return today to Elston Avenue between North Avenue and Magnolia Avenue. The difference now is that buffered bike lanes and a cycle track replace last year’s conventional bike lane. The full project limits are North Avenue to Milwaukee Avenue, a distance of 1 mile. The enhanced bikeway should definitely bring cyclists back to Elston Avenue, after what I perceived was a period of avoidance. A cycle track at the “Y” intersection of Elston and Magnolia Avenues should reduce the incidence of high-speed, northbound passes. Update September 7, 2012: From the Wicker Park-Bucktown SSA, we get news that this project has been pushed back to spring 2013. It seems IDOT is responsible for this delay. The skewed intersection of Milwaukee Avenue, Wood Street, and Wolcott Avenue in Wicker Park will be redesigned and reconstructed this year as part of a project to upgrade the signals. The original project only called for upgrading the traffic signals, which are decades old and very hard to see. Their timing is also awkward, providing no “all red” phase between the red phase of one direction and the following green phase of the cross direction. Construction should begin in September, according to the 1st Ward office. Confusion is compounded with the addition of a rare slip lane on Wood Street at Milwaukee Avenue, which is created by a small island of concrete that only holds a light signal pole for southbound traffic. More often, islands are used to help protect pedestrians from traffic. View the intersection in a larger map on Bing Maps. I went to Copenhagen, Denmark, in January 2011, and I was there for about 48 hours. I met Mikael of Copenhagenize, who lent me his Velorbis bike. I biked as much as possible, at all hours of the day, and I encountered a lot of the cycling infrastructure that makes it easy to bike and encourages the hundreds of thousands of trips by bike a day – even in winter! This photo essay shows one of the ways you can design an intersection to facilitate safe right turns and through-maneuevers, for both people driving and cycling, as seen in Copenhagen. I’m posting this to show an alternative to the centered bike lane design common in Chicago that leads to many unsafe merge maneuvers that I mentioned yesterday in A tale of five bridges (first photo). Update December 2, 2011: Mike Stephen asked me for the Outside The Loop radio broadcast some more questions about these choices. 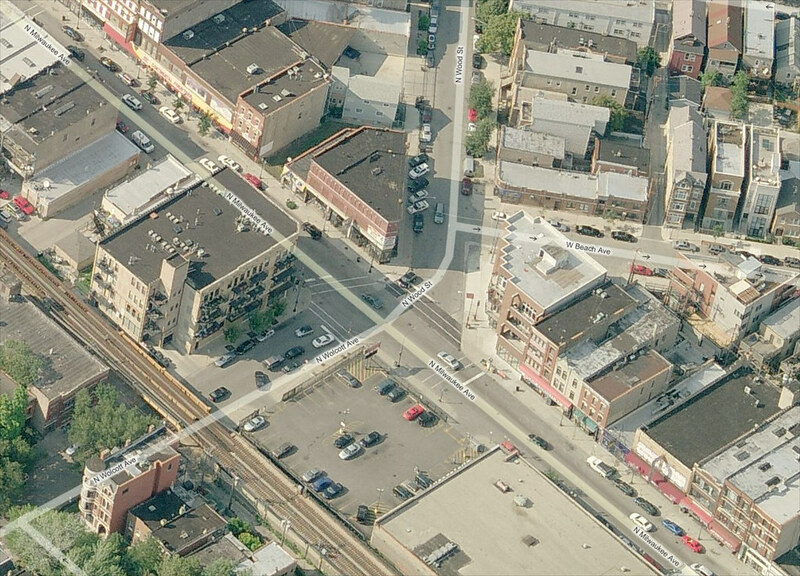 Did you get a response to your comment about the Damen/Elston/Fullerton project? Showing in red the right of way of the new road and showing in a transparent blue the property that will be affected and where property will have to be acquired. If you also received a response, I’d like to read it and share it here. The responses will help us understand the status of the project and how the design process is going. Send me a copy of the response you received: steven @ gridchicago.com. Next week I’ll be posting a new article and the response I received. Perhaps if the intersection has room for safe cycling, then people won’t feel the need to cycle on the sidewalks. Posted on November 23, 2011 January 16, 2012 Author Steven VanceCategories Design, Page 2, Planning & PolicyTags Damen-Elston-Fullerton, intersection, public outreachLeave a comment on Did you get a response to your comment about the Damen/Elston/Fullerton project?